BBQ has been a hobby for me for several years. In the world of smoked meat, I'm a weekend warrior. My cooking experience has been limited to small parties and family gatherings. I've enjoyed serving "Q" to my friends and family and have been thankful for the positive feedback that I've received. This weekend provided an oppurtunity for me to up the stakes a bit. Through a family connection, I was asked to cook ribs for the first annual WSIC Community Picnic in Statesville, NC. Initially, I was flattered by the offer, but it didn't take long for the reality of the situation to hit. Though nobody could be sure, but the event organizers were expecting several thousand attendees. I had never cooked for more than 25 people previously. Guessing at the amount of food and supplies to purchase for the event turned out to be a tall order. 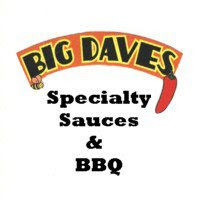 In addition to ribs, we also had several hundred servings of baked beans, hot dogs, chicken legs, potato chips and nachos. In addition to the food, we had to take our best guess when buying things like Aluminum foil, paper towels, and serving trays. While the folks at WSIC focused on purchasing the goods, I was charged with figuring out the best way to cook them. I was provided with two large trailor smokers unlike anything I had ever cooked with before. Anyone who BBQs on a regular basis knows the difficulties involved with using an unfamiliar pit. Every grill / smoker heats and cooks differently. I've spent several years refining the cooking process on my home smoker. This weekend, however, I was only going to get one shot at it. Filled with nervous energy, I set out for Statesville early Friday morning. By 11 a.m., I was trimming and rubbing racks of ribs. The first ribs hit the smoker around 1 p.m. A late arriving assistant and second smoker delayed the work considerably, but we worked around the various organizational obstacles that popped up and simply did the best we could. The second smoker proved to be difficult to work with. I struggled a great deal with maintaining an adequate cooking temperature. Every time the lid was shut, the fire was smothered and the temperature dropped. Luckily the owner of WSIC, Mark Sanger, had some experience in such matters and was able to get things going late Friday evening. By 10 p.m. on Friday, it was becoming quite clear that we were in over our heads. Though my brother in law, Brendan Sanger, had arrived in the afternoon and provided a tremendous amount of help, there were still dozens of racks of ribs that had yet to smoke. I had planned on leaving around ten and allowing someone else to tend to the remaining ribs, but it was pretty obvious that sleeping was no longer an option. So, we forged on. We sat in our lawn chairs, chugged caffinated sodas and tended the fires late into the night. We all managed cat naps of various forms and lengths when we could, but the morning arrived quickly. The picnic opened at 10 a.m. on Saturday and the crowds arrived early. We were all exhausted before the event had even started, but I was encouraged by one very important fact. The ribs had turned out wonderfully. I can't be sure of an exact count, but we smoked 60-70 racks of ribs. Most of them were spare ribs, but we also had a couple dozen racks of baby backs. From 10 a.m. to 7 p.m., I manned the grill with the help of Torrie (Brendan's wife) and Cathy (Mark's wife). 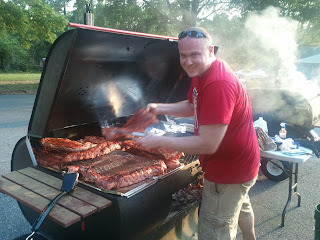 Brendan, along with additional WSIC volunteers, served the patrons and advertised the ribs. I have to give Brendan a special mention here. Not only was he crucial in helping me prepare the ribs, he was the absolute difference maker when it came to selling them. He wouldn't let anyone walk by the booth without buying ribs. I'm pretty sure that he was singularly responsible for 60% of our sales. The 7 p.m. close marked 32 consecutive hours of prepping, smoking, and grilling ribs. I was dehydrated and exhausted, yet oddly satisfied. It was very affirming to get so much positive feedback from the community. The ribs were really a hit. Despite the difficulties, the weekend has easily become my proudest BBQ moment. Without question, the overall event was a success. There was a large crowd and everyone seemed to be entertained, well fed and satisfied as they made their way back to their cars. The difficulties that we experienced were mostly behind the scenes and can be attributed to a lack of experience. We all learned a great deal about what it takes to cook on a large scale. The weekend only encouraged me to move forward with plans to cater events in the future. I hope to apply what I learned as I move forward. I'm thankful to Mark (and all of WSIC) for allowing me to represent them. It was a big day for the station and the community. I appreciate the fact that they put their confidence in me. Click the title of this blog post to view photos from the event. 2 Response to "WSIC Community Picnic"